In yesterday's comments, Valarie S. made a good point, that "older" often means "sturdier", in regards to household goods, appliances, tools and equipment. I have found this to be the case, as well. And this line of thinking has kept me from replacing appliances, simply because I want the newer and prettier model. My parents had an Oster blender, wedding gift c.1957, which continued to perform well for their entire marriage. There was nothing fancy about their blender. The switch had two functions to choose from, "on" and "off". But did it ever work. It chopped ice, made shakes (back in the 60s and 70s, we didn't call them smoothies, but called them shakes), pureed vegetables and more. That thing was built to last! 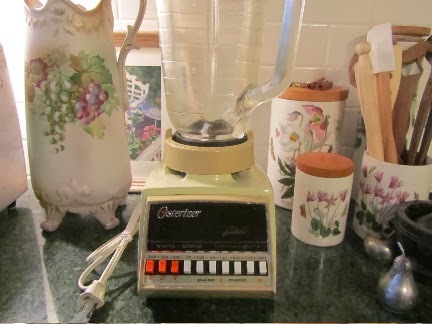 In 1981, my sister gave me an Osterizer blender. And guess what? It still does smoothie-duty almost every morning. In 33 years, I've replaced the gasket a half a dozen times, and I've sharpened the blades a few times. When my blender was given to me, my dad told me what I needed to do to take good care of it. And it's lasted, and lasted, and lasted. I've used it on ice, to puree soups, to make smoothies, and even to make peanut and sunflower seed butters. I'd say, for near daily use, it's held up well. 33 years and going strong. One of the things that really impresses me is how much of this blender is heavy-duty metal, and how little of it is plastic. This was standard for appliance design in the past. Not always the case today. Making your older appliances stand the test of time does require some work. On a blender, replacing the gasket will not only give you a better seal between the jug and blade assembly, but the rubber gasket becomes ever-so-slightly pitted, and can harbor bacteria as a result. Cost to replace the gasket, about $1.50. Taking the jug and blade assembly apart regularly, to clean it thoroughly, is not just good kitchen hygiene, but it will prolong the life of your gasket, and give you a chance to check the blade for nicks. Cost to clean the blade assembly, nothing but warm, soapy water and a rag. After washing the blender jar, don't place it back on the base unit until the bottom of the blender is totally dry. Placing a wet blender jar on the base unit can cause corrosion of the square drive pin and plate (the place where the underside of the jar connects with the motor base assembly). Cost to leave it to dry, nothing but patience. But should you find your square drive pin and plate (on Oster models) have corroded, no worries. You can order those Oster parts for under $7. When I reach the point where the blades can't be sharpened another time, then replacing the blade unit will be a good, and cost-effective option. Cost to replace the blade assembly, about $10. When I was searching online for a gasket last week, I found that not only could I order blades, the jar nuts (that plastic cap-like piece that holds the blade), the glass jars and the lids, but I could also order parts for the base unit of the blender that I have, should those wear out someday. Good to know. A company like Oster is well-known for the quality of their products. In fact, their motto is "Legendary performance. Designed to last." And that they do. Their blenders have been around for many decades, and they strive to keep parts available for even some of their older models. I've gotten over 30 years of use out my Oster blender, and I expect I can get another decade, at least. No need for the newer, fancier models. Maintaining the older appliances in my home is definitely well worth it. I have the same blender given to us by an older lady we happened to meet who was downsizing shortly after we moved to Canada. It never occurred to me that I can get spare parts, thanks so much for this! It's the best blender I've ever owned. Isn't it a great blender?! These older Oster blenders continue to be rated quite highly. I have a friend who also has the exact same model (even the "almond" color). She bought hers about the same time as mine was given to me. And she has had the same good experience with her blender. There are some much pricier blenders on the market. But for me, they're just overkill for the money. My friend has the same exact blender and swears by it. Mine is a bit older and before plastic was big. It belonged to my grandparents and is the only one I ever remember in their home, I was told it is several years older than I am. The base is metal and the container is made of glass. I love it and take good care of removing the blade and gasket after each use and allowing them to dry thoroughly before reassembling it. I love these old appliances. They were built to be the one and only of that type of appliance that a home would ever need. It really bothers me how cheaply some new small appliances are built. The other thing that makes your blender special, is knowing that your grandparents used that exact blender. There's a feeling of continuity from one generation to the next, when items are passed down and used by the younger generation. I got a cheap blender as a gift years ago. When the plastic jar dropped on the floor and cracked, we got a better blender rather than replace the jar. We now have a better quality model that preforms better and hopefully will last a long time if we take care of it as you have suggested. I'm sure that your newer blender will last a long time. A shame about the cheap one. I was in Target a couple of weeks ago, looking at appliances, and I happened to look at the floor models of a couple of cheap blenders. I picked the jar up on one, and looked underneath, and the jar base had plastic parts that I'm sure will break off with just a small amount of use. It was disappointing to see. Someone will unsuspectingly buy that for themselves or a gift and have it fall apart in short order. My mom gave me her old Osterizer--it has multiple parts with many functions--it's a blender, it's a mixer, it's a food grinder, and yes, it's the exact same almond color. However, I have it packed away for occasional use. The feature I would most like it for is the bread-dough kneading and it doesn't perform well for that. Countertop space is at a premium in my kitchen so in the past year I've become very picky about what lives on top of my kitchen counters. However, like Jessica, I didn't realize it had replacement parts (or that I could sharpen the blender blades) and that is really good information to have! We put our blender away after each use, too. Too little counter space. But we happen to have a tall cupboard right next to an electrical outlet, so the blender goes in there. Our model is lightweight enough to move in and out of a cupboard. I think that is my deciding factor in what stays on the counter and what gets put away. That, and if it's still hot when I finish with it (like the toaster). Hot things stay on the counter all the time, too. If you google "Oster" "blender" "parts" you should find a few places to order parts for the blender attachment, at least. I've only bought used blenders from garage sales and thrift stores. I blew the motor in my last one trying to make a smoothie with frozen berries. The one i have now is also made with plastic parts. I know it won't last, sadly. When i use a blender i put it through the paces so it's good to know about replacement parts for the Oster. I'll be looking for one come garage sale season! A shame about your previous blenders. I've been very happy with my Osterizer blender. I know I must sound like I've been paid to endorse their product. But, no, just a happy owner of one of their blenders. I still use my Mom's blender from the 1960s, which I believe came from Kmart. It use it regularly and it shows no signs of slowing down anytime soon. They used to build things to last, but with "planned obsolescence", sadly with many items like ink jet cartridges, and light bulbs, and appliances those days seem to be gone. For manufacturers it comes down to the bottom line and they are in the business to make money, so if they can make products that need replacing sooner, they will make more money. My Mom's refrigerator from 1986 and it is still working. It would probably be better for her to buy a new one since the newer ones use less electricity, but how long would it last? You know. We bought a new dryer a few years ago and I am not kidding, it only lasted two years before it died. We had to buy a new one at that point. I've read online that some companies are realizing consumers are not going to stand for that so they have had to make products last at least a little bit longer. Anyway, I love the older appliances because they seem to last forever. I have my grandmother's Kitchen-aid mixer that she used for years and it is still going strong. That's fantastic about your mom's blender. It may just last your entire lifetime, with a few little fixes here and there. And your grandmother's KitchenAid, too. Wow! Hang on to those. I would have been very upset if we'd had a dryer breakdown just two years after buying it. I sure hope that manufacturers will be designing and building appliances to last longer. It's costly and aggravating for the consumer, and fills our landfills with too much junk, when we have these appliances that are shoddily built. A big gripe of mine! Our garage fridge was bought in 1977. It does use a lot of electricity, but it still runs and has never needed a repair. I try to use it more judiciously, by shutting it off for the late spring/early summer, to minimize excess electricity use. But that thing is so well-built that I hate to get rid of it. What a great blog and I loved reading the comments too. I live in Australian and haven’t heard of these brands but I wish we had something like them. I am on my fourth blender in about five years. I know I have a bit of passion for small appliances but I must be seriously bad at picking them. I need to get better at buying appliances that last.